It was when I didn’t return home, and stumbled around town. It was a voice warmth as the spring sun, like the breeze as the petals fluttered. Thinking back, I felt I was initially mesmerized by that voice. We were at an ordinary empty space, commonly seen in town. This place had nothing to do with me, other than a white cat which I once buried here. So naturally, I knew nothing about her at all. Her skin’s white as porcelain. She had soft cloud-like silky hair. Her large eyes were clear and deep. And a confession from such a girl left my mind completely blank at that moment. Finally, left behind was an emotion I felt for the first time in my life. It’s hot, painful, but didn’t feel bad. I allowed my to be driven by that heat, and earnestly conveyed my feelings. And once I answered, she beamed. Yet, she seemed a little forlorn. Finally, she reached her little hand forth. I did as she said, and held her hand. Her hands were cold, maybe because they were bare the entire time. Once both of us held hands however, the warmth spread from there. Making sure I didn’t hurt her hands, I held them carefully and firmly. It happened in winter, during my third year of high school. The next day, Yuki and I met up at the front school gates. You’re going to school tomorrow, right? I’ll be waiting for you at the school gates, 4pm. So she proposed, giving me a look of one unwilling to compromise. Because of that, I could only nod my head in agreement. I left school a little earlier than the agreed time, and found Yuki dressed in a slightly oversized camel-colored coat, waiting for me. I called her name, and she waved her slender hand hard. It’s like a puppy seeing its master return, wagging its tail. Every movement of hers was filled with delight. I reached my hand out, and Yuki held my hand. What did she mean by the word always? Yuki’s mouth was half opened as she blinked away. Several seconds later, she burst out laughing. I don’t think I said anything funny, right? For some reason, my face was a little hot. Yuki suddenly grabbed my hand, and went forth. I panicked, chased after her, and walked beside her. Our clasped hands just so happened to end up right between us. Yuki and I were dating. But it lasted only for a week. I asked, and Yuki started to take a deep breath. Following that, she started breathing in and out cutely, her ample breasts expanding and contracting. After doing that for three times, she finally seemed to have made up her mind, her eyes glowing. However, that light immediately vanished from her eyes again. Nevertheless, she never gave up. It’s the story of a girl whose existence will vanish like the snowflakes in a week, and her 213 encounters with an ordinary boy. They had several encounters together, spent time together, and created memories together. But in the end, everything was erased. But even so, when Yuki talked about that unbelievable story, she was giving a sad, yet blissful smile, just as when she confessed to me. We saw the flowers in spring, the fireworks in summer, ate lots of delicious stuff in autumn, and went to the seaside in winter, so she said. I tried recalling, and it seemed that did happen. I was alone at the beach during winter. With nobody next to me. Naturally, there was only one set of footprints on the beach. I remembered how chilly it was very well. Ah, but when I went back, I recalled buying some delicious oden at the convenience store. I bought a lot, and ate a lot. What Yuki spoke of ended up like that. It’s not so much that I forgot everything. I said. Without any hesitation. I really liked her little face, her slightly curly hair, her wearing the slightly oversized coat, and the silky fingertips poking out from the sleeves…her chest’s big too, and her clear voice’s fine too. I like everything about Yuki, even the air surrounding her. She’s giving off the sakura fragrance I like. That’s what I thought the moment I met her. It’s like Yuki’s the ideal girl God created for me. Yuki wasn’t like this in the first place. She spent a lot of time trying to become my ideal girl. I wanted to believe the four years she told me about. I couldn’t deny Yuki’s words and feelings with just common sense. For me, what she told me with a smile was the truth. I suppose that’s good enough. And this is how we started our limited period of love. We left school, and for the entire time, Yuki was feeling pleased. She hummed away. It was a love song commonly aired on the radio during winter. She was humming a love song that was trendy several years before I was born, with that wonderful voice and somewhat offkey rhythm. We passed the arcade before the station, and then passed the rotary intersection. We glanced back at the old pachinko shop that had closed just last month, arrived at the post office, and made a turn at the third corner. My left hand was still holding Yuki’s hand, and her right hand kept holding mine. In our free hands, we were holding taiyakis. A moment ago, Yuki spotted a shop on the shopping street in operation. She was watching that little shop with a watering mouth, so I asked, want me to treat you to one? She gave a delighted look, really? And so she beamed like an innocent kid. Over the next five minutes, Yuki was wondering if she wanted the red bean or the custard cream. I was intending to buy the taiyaki Yuki didn’t buy, so to be honest, the 5 minutes were meaningless. It’s simple. There’s two of us here, each one of us buys one flavor, and we’ll just swap. I didn’t say it though, because seeing Yuki troubled like this is pretty cute too. So Yuki chose the red bean, and I bought the custard cream. We both had cat tongues, so we waited for the taiyaki to cool before we dared to eat. The crispy skin and the custard cream meshed together, and the inside felt soft. Yep, delicious. I nibbled and enjoyed it slowly, but Yuki finished hers in a matter of seconds. Yuki chewed a few mouthfuls, and heartily swallowed the taiyaki. She then smiled to me, ahhh, opening her mouth. It basically means, give me yours. Yeah, I know that. So what? Yuki made such a look as she tilted her head. Hearing what I said, Yuki finished the remaining 80% taiyaki into her mouth. She puffed her little cheeks, chewing away heartily. I said what I was thinking, and Yuki seemed to be panicking a little. She chewed quicker than before, and quickly finished the taiyaki. She said that a little faster than usual. I enjoyed Yuki’s panicked look as I kept walking. Suddenly, something red appeared in my sights. Once I saw the words, I stopped in my tracks. Yoshi-kun, who teased me with a really, really mean joke, suddenly stopped in his tracks. What’s the matter? So I thought, and looked towards where he was looking. I saw a red flag fluttering in the wind, the flag of a little cake shop. Next Wednesday’s February 14. It’s said that’s the day boys really want to eat sweet stuff. Once our date ends, it’ll be Valentine’s. Yoshi-kun was bashful whenever he mentioned the word girlfriend, and it’s pretty cute. Now that he mentioned it, I never gave him chocolate before. Also, I owed him a huge favor. It’s better to repay what I can. Of course. I’m a girl after all. That morning, I woke up from my dreams, and saw a world of silver outside the window. It seemed the snow that fell since yesterday had piled up. The sunlight shining through the clouds were refracted by the white snow, and my just opened eyes were aching. I rubbed my sleepy eyes, left the room, and the cold air that came caused me to shiver and sober up. The wooden floor was really cold. My soles were aching. Like usual, I descended the stairs with much hesitation, and saw mom sweeping the room without much fuss. Saying that, I opened the corridor door, and went to the postbox to retrieve today’s newspapers. Dad’s more terrified of the cold than I am, so in winter, I’m the one collecting the newspapers. Natsuna doesn’t fear the cold, but she’s disobedient. The little courtyard was covered in white, with a set of footsteps leading outside. Surely that kid ran out while yelling yahoo or something. I could vividly imagine my little sister having fun. Given how deep the footsteps were, it’s obvious she ran out with much vigor. Uuu, so I groaned, and the white breath I huffed out was blown away by the frigid winds. I pulled the sleeves of my jumper to my fingers, and opened the postbox, reaching for the morning newspaper stored in the clear bag like usual. Suddenly, there was a voice. I lifted my head from the postbox, and there was Yuki. There’s a floral fragrance, a little too early for this icy weather, coming from the courtyard covered in white snow. Why’s she here so early in the morning? I thought she could have just called me, but Yuki had no cellphone. As I said, I hurried back into the house, and got ready to leave. I left the newspapers before my dad, who’s huddled completely in the kotatsu, devoured the breakfast Natsuna prepared, changed clothes, brushed teeth, combed my hair, and told my dad, who had no intention of leaving the kotatsu, I’m going out. Ohh, he weakly replied, and I wasn’t sure if he understood me or not. The brand new snow surface was left with our footprints alone. My house’s in a suburb a little away from the town center, and the endless fields there were covered completely white. There were many little light particles glittering upon the pure white snow. So after walking a while, someone could be heard screaming. I looked over at the voice, and saw a little silhouette. It’s Shouta, the elementary school kid living nearby, and his blue sweater was covered with snow. His face was really red, his forehead covered with lots of sweat. He ran to us, thank goodness, and finally heaved a sigh of relief. Once I remembered this, I stopped thinking. I should have, but just as I can’t stop immediately after sprinting, I couldn’t stop thinking that quickly. Yeah, I just so happened to notice it. Wasn’t there someone who went out to play early in the morning? I don’t want to be her nanny on such a precious day. But my determination was immediately changed. Without looking, I could hear a familiar, distinct girl’s laugh. Very clearly. See, you can’t run now, Shouta seemed to be scolding me as he called my name. But Shouta ignored my pleas as he mentioned the cause of that laugh. Damn it. Alright, I get it. Yes. I really do. So I sighed, and gave on up resisting as I looked over at the source of the voice. There’s no doubt. That’s the voice of our super duper cute little sister highness. Well, my little sister, Natsuna Segawa, she’s like a typhoon. She’s cute, and pretty popular, but she always gets all kinds of people along to expend energy, which she had lots of. The elementary school kids nearby notably were often her sacrifices, and they’re all terrified of her. This time, it seemed to be a case. According to Shouta, it was just a snowball fight between the kids, but Natsuna saw them. She, who had the heart of a schoolboy to begin with, couldn’t possibly hold in her desire. I vividly imagined her joining in with a bright smile, without a care in the world. Problem is, once Natsuna joined, she added a rule that the losing side has to obey what the winning side says. A group of elementary school kids versus someone whose athletic ability is top notch amongst middle schoolers. Now what will happen? It’s easy to imagine. The boys had to fight to the death to avoid the future of becoming Natsuna’s lackeys. I looked over, and saw Yuki stretching and warming up for some reason. Faced with Shouta’s innocent question, Yuki knelt down to his eye level, and smiled at him. He immediately blushed. In response, Shouta’s eyes were glittering more than I ever saw of him. Yuki said that, and Shouta, who was shaking hands with her, suddenly frowned. He looked down, giving off an apologetic look. Yuki and I exchanged looks. After Yuki joined in, Natsuna’s team had ten players. After I joined, there’s five in the team. They outnumber us two to one, but in this snowball fight, anyone’s tagged out whether they fall knee first, fall over, or give up. If they don’t panic too much, they probably won’t lose. That was what I thought. As a guy, if I’m to lose in a battle of strength to a girl, to my girlfriend and little sister for that matter, it’ll be really embarrassing. Both teams had gathered piles of snow in their camps, and while it’s not tall, it’s possible to curl up and use that snow as a wall. I hid beneath the snow closest to the enemy, quietly waiting for the moment. Suddenly, my team stopped attacking. Natsuna loves to make noise, so once things calms down, she’ll definitely charge out alone. My aim’s to go for the unexpected and counter with a sucker punch. So I waited for a while. As I planned, there’s a madlad charging madly into the enemy camp. It’s a showy girl with a red muffler, red coat, and red muffler. This energetic girl really loves red. So she yelled as she charged in with tremendous speed. Well, there’s a nice target. I aimed at her wide open mouth, and threw a snowball in with all I got. Natsuna made a weird sound, and stopped running. She wiped at the snow sticking to her face, and kept spitting it all out. I created a strategy for this purpose. I threw a snowball at Natsuna’s face while she was still wobbly. Every shot was aimed high enough for her to evade if she ducked. Natsuna’s able to dodge one by jumping back, but her center of gravity went back as a result. I threw the next one a little lower, and she dodged that too. Her center of gravity was shifting back. Basically, it’s a limbo dance. I repeated the same three throws, and Natsuna finally lost her balance as she landed back with a thud. I raised a hand, informing my teammates that I beat Natsuna. She, having collapsed, kept complaining. Seemed like she’s not reflecting on her actions, so I fired another shot at the loser. Everything’s as planned till this point. But I forgot something. I forgot that among the enemy team, there was a very forthright elderly. It’s her first time playing a snowball fight. Thus, she didn’t know of any tactics or counters. And without thinking of anything, she just did what my sister told her to do. She didn’t know this was the best way for them to beat us. With a clear shout, all nine remaining members of the enemy team came attacking with snowballs. If there were similar numbers, our side would be advantaged. We could counter with sucker punches just as I did against Natsuna. However, they have almost twice our numbers. If they just attacked with numbers, there’s no way we could handle them. Many snowballs flew by, and one of them landed right on my face, causing me to make a similar sound. That’s why Yuki, who has the sakura smell on her, was assigned to the opposing team. Ah, damn it. Natsuna gave such a look, and quickly looked aside. She couldn’t whistle, but she was still pouting, blowing as she pretended to whistle and bluff her way out. My little sister’s really hopeless after all. Speaking of which, mom wanted Natsuna, a middle schooler, to act more like a girl, and pushed many things on her, but it seemed she wasn’t really accepting. While we’re arguing, the enemy team came attacking, and I was bombarded in concentrated fire. I intended to recover, but they didn’t give me the time. Leading the charge and pelting snowballs at me was a girl who minutes ago said the unbelievable adorable words, this big sister is Haru-nii’s girlfriend. Yuki’s words kept echoing in my mind. This big sister is Haru-nii’s girlfriend, girlfriend, girlfriend. It’s just my imagination. My delusion. Finally, i fell. My face lost all senses for a moment after being heavily bombarded. I didn’t know if I was aching or cold, and I couldn’t smell. Yuki looked down on this fallen me, and gave me a guts pose. Right, so the loser has to obey the winner. I weakly waved my hand to admit defeat, and Yuki nodded heavily. I just muttered, as I was too lazy to explain. That’s weird, snow and sakura are of different seasons, so she muttered, just as a certain person just said. It’s the seventh day Yuki and I became lovers. On this workday, we went to the theme park at the rooftop of the department store. The mini ferris wheel there was rusted all over due to the wind and the rain, and of the five cars designed with anime characters, three of them were labelled with ‘malfunctioned’. The only ones that could work were a blue cat robot and an electric mouse with red cheeks. There’s a boy seated in the electric mouse, and after moving for about 3 minutes or so, it stopped right in the middle of the theme park. The thick pile of snow yesterday had basically melted completely, with a few in the shade. The snowmen faces were half melted. We sat on a plastic bench missing a corner. This was the only place for us to sit and rest. I looked up at the grey sky, muttering. She answered, as though it was a matter of fact. I lost in the snowball fight yesterday, so I had to obey Yuki’s wishes. Initially, the rule was that the loser had to obey one thing the winner wanted, but now for some reason, it ended up as me having to obey her for the entire day. Seriously, girls are amazing at getting others to accept their demands. Well, I don’t really hate it. Yuki said, so my first wish is, a date. There are two places I want to go with you, Yoshi-kun. This is one of the places. Yes. Anything’s fine as long as Yuki’s happy. I patted my knees, stood up, and reached my hand out to Yuki. Yuki tried various excuses to get out of this, before she finally held my hand. It’s my victory for ignoring all her excuses. I asked her which one she wanted to ride on, and since she liked cats, we took the cat robot. While Yuki tilted her head cutely, I inserted a coin, excusing myself. After hearing my excuse, Yuki scowled in anger, but I managed to escape the cat robot before her fist reached my face. It began to move slowly, along with the strange music. Ahh. It’s really embarrassing. I looked towards Yuki, and found her face reddened to the bottom of her neck, her hands covering her face. She’s really cute when she acts like this. I quietly decided that I would let her beat me once or twice. Finally, Yuki had me treat her to juice from the vending machine, instead of hitting me. I slipped the coins in, and green lights appeared on the buttons. She gave a grim look, wondering, before choosing the cocoa drink, and I too bought the same. Both of us couldn’t drink black coffee. While we’re not kids, we’re not old enough to be called adults. At this point, we’re on the boundary between these two age groups. We leaned our backs on the parapet, drinking the cocoa in unison. Both of us were close to each other, and I just needed to move a little to touch Yuki. I could truly feel her presence, her warmth, and her smell. Her hands were on the can, trying to warm them, as she drank slowly. Yuki closed her eyes, as though recalling something. Saying that, Yuki paused. She probably wanted me to ask what she wanted to say, since she waited for me to ask. So I did. Nn, so she muttered, and opened her eyes slowly with satisfaction. It’s not some tear inducing words, yet I felt my nose a little itchy. I looked up at the sky to hide this sight, staring at the reddened clouds there. The bright, stinging red shone deep into my eyes. Suddenly, Yuki reached her hand out, patting my head. She’s not as tall as me, so she tiptoed. The place she touched was very warm, very comfortable. Now we’re even, so she said as she stroked her fingers on my hair. Ahh, it’s itchy. What’s going on? Why do I feel this happy just because of this little thing? I could feel the soft touch of her hand, and ended up smiling. Very good, so Yuki said after seeing me smile. The sun set, and the place we were headed after the theme park was my high school. It’s the other place Yuki wanted to visit. It’s past 7pm, and in the darkness, the school lights were already off. The only places with orange lights on were the office, self study rooms, two second year classrooms and a first year classroom. Those taking the entrance exams were probably in the self study rooms. The third year classrooms were completely dark, just nice for us. I held Yuki’s hand as I snuck into the darkness of the night, slipping into school. Our footsteps echoed in the dark stairs. On the way, we spotted a teacher, so I hid Yuki behind me, telling the teacher that I forgot something. Oh, so the response as the teacher let us off. I guess the teacher couldn’t see Yuki’s face clearly due to the darkness. Once the teacher disappeared, we heaved a sigh of relief, before we went over to my classroom. Luckily, the classroom isn’t locked. I slid the door aside, and with a familiar creak, the classroom and the corridor were linked. The sacred moonlight shining through the window dyed half the classroom silver. It was a very familiar classroom to me, but for Yuki, it was a new sight as she looked around with excitement. Wow. She squealed with excitement, touching the desks as though they were gemstones. Ahh, there’s graffiti, so she said as she wandered around the classroom, before she suddenly looked towards me. I was mesmerized as I watched her, and was a little slow to react. However, I somehow answered her. 1, 2, 3, 4, Yuki counted as she went over to my seat. She patted my chair. What else was I supposed to do? Of course, I was to sit on where she indicated. I should be familiar with the sight of this classroom from my own seat, but with Yuki sitting next to me, everything seemed brand new. The old desks, the chalk marked blackboard, the papers with the boring class targets were all filled with light. I blurted out my thoughts, and for some reason, Yuki said, looking really gleeful. Yuki’s voice was very close. For every move she made, the desk shook. Something within me kept shaking away. Once I said that, Yuki grinned. Hey, repeat that again. Don’t wanna. Please. Really got no choice here, huh, Shiina-senpai? Good, now one more time. Shiina-senpai. Once more, a little more intimate. Call me Yuki-senpai? Not bad no bad. One more time. Seriously, don’t Yuki. You’re like a pervert here. Your eyes are glowing. You’re calling me a pervert? How rude. Whatever I said, Yuki would laugh, get angry, look disappointed, or pout. 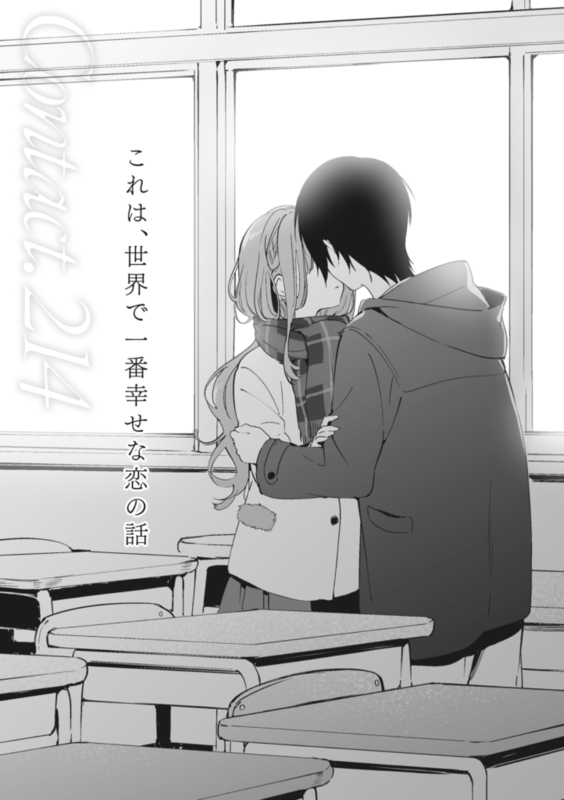 Within this classroom, Yuki and my voices were the only things echoing. While we chatted, so why? I asked. I really wanted to ask this right from the beginning. Once that name was suddenly mentioned, I was taken aback. She stood up from the chair, and pulled her distance from me. The breeze lifted her long skirt slightly. She was in the darkness, standing there like a divide between the light and the darkness. I repeated this words, and immediately felt the pain all over my body. Guess she wasn’t planning anything else. Yuki said that we met hundreds of times. Surely in the future, we’ll meet countless times again. Hey, isn’t that right? I called her out to appeal to her, and she narrowed her eyes, scratched her cheeks, and finally shook her head. Her name’s like a preset as it came naturally from my mouth. Suddenly, a sudden impulse struck me. I couldn’t resist it. I hurried towards Yuki, and embraced her petite body slightly. The sweet sakura scent came. No, that’s not it. For me, this is already Yuki’s smell. It’s all Yuki’s fault for making me like this. I brought my face to Yuki’s chuckling face. It seemed Yuki knew what I wanted to do as she closed her eyes tight, Her cheeks turned red as she finally got ready to accept me. She’s really cute; I really didn’t know how many times I thought that. In this corner of the world even the moonlight couldn’t reach, we made a kiss nobody else knew of. As we touched, her lips were really cold, trembling. It’s clumsy, just a tender kiss between lips, but we were so much sure of each other’s feelings, each other’s warmth, compared to the countless confessions and hand holdings. Humanity as a species had used this act to clearly identify each other’s existence. After what seemed like an eternal five seconds, Yuki buried her face into my chest, seemingly to cover her own face as she sulked away. But I knew she was just hiding her embarrassment. She was really cute in that state, so I smiled. See, it’s all Yuki’s fault, right? No boy can resist it when there’s such a cute girl before him. Yuki lifted her head. Her face, and even till her ears, were completely red. So our lips kept touching over and over again. Yuki and I split up at the front gates, and while I was walking home, the smartphone in my pocket rang. ‘Public number’ were the words written there. Normally, I would never pick up this call, but I did. For a reason. I had a feeling I knew who called. Before she said her name, I called her. You’re right, so she answered. The voice from the phone was very soft, yet it seemed closer than usual, and I could even hear her breathing. It was something just right beside me, within my hand. I went to the street light, which was still buzzing away, and leaned my back on the pillar, looking up at the sky. Where is she right now? So I thought as I pricked my ears to listen. Even this dull witted me knew that her voice was because she was feeling cold. I answered without giving much thought. I didn’t realize that this was the last fork in the road. This was Yuki’s last wish. I immediately looked at the watch. There’s still an hour until 10.54pm. Sweat was slowly seeping from my back. The weather’s cold, but for some reason, I was feeling hot, unbearable. I didn’t want to hear anything. I wanted to cover my ears, to grab the happiness that was in my hand moments ago, go back home, and sleep. Ahh, what if it’s as I wish? But Yuki immediately turned that into an illusion. She gently muttered those words. –I’m going to die now. Her voice seemed to be filled with joy, and tears. It’s not the answer to my question. Yuki herself probably understood this, and deliberately said these words. But even so, I had to realize there was no pretense in her words. Again I ran towards the road I took. I passed the bridge, and dashed into the park. The toilet lights dimly lit the road. I retracted my steps at the fork, hesitating on where I should go. Ahh, damn it. I’m wasting precious time just being frustrated. In the end, I went to the station. So Yuki kept listing the promises made nowhere on this world, but in her heart. I couldn’t even apologize to her. No, I had no right to apologize. So, Yuki’s voice was feeble, at least fulfill this promise! I saw no signs of Yuki. I looked around, nearby crashing into an uncle riding on a bicycle, stumbling around. Watch where you’re going! Don’t call and run! The uncle glared and yelled at me angrily. I lowered my head slightly in apology, and ran to the town hall. I could hear what the uncle was saying, but I didn’t look back. I kept running, all to keep looking for Yuki. Ever since the day I lost everything, I walked on alone till this point. The directionless emptiness, rage and hatred unwittingly became the reason I lived. Without any of these things, I probably wouldn’t be able to stand up again. Until the day he called out to me. It’s not a metaphor, and it’s not a joke. The world changed ever since that day. That became my reason to live. He fulfilled the many things the younger me wanted to do. Before I knew it, the emptiness, rage, and even hatred vanished, and something warmer filled me instead. I can no longer look away from these feelings. I’ve fallen in love for the first time. What shall I call these cute, wonderful days? I wondered, and shook my head. This isn’t something worth being named. We wanted to be together, forever. To head to the ends of the world together. But it’s impossible, it can’t be fulfilled. The end of these days, our ending will be filled with overbearing sadness. We kept encountering each other, for the sake of this one farewell. The road before the town hall was pretty empty, nobody on the road, and it’s quiet everywhere. The round street light was making a round prism. Looking down, I saw three shadows at my feet, one facing right, one facing left, and one facing forward. There’s probably light sources from each direction; right, left and straight. Which side should I take to get to Yuki? And without knowing, I went forward. I didn’t know why exactly, but I was quietly confident of something. Yuki’s only in front of me. So, yes, I ran forward. The shortest distance, the fastest speed possible, towards Yuki. The orange light shone upon me, hiding with the clear glass. The wind’s howling outside, and a poster was fluttering with the wind, probably because a nail holding it down on the old billboard had fallen off. I tried reaching my fingers forward, but I was blocked by the glass, unable to touch it. I moved my fingers away, and there were marks of my touch on it. Right now, I still exist on this world. Yes, I still exist in his heart. Surely, to Yoshi-kun, I’m a very cute girl. If he finds me cute, that’s fine. Ahh, but he did say I’m very stubborn, that I’m a meanie to him, that I fawned around with him, so it might not be cute. I showed him my dirty side. He said I was really a glutton. And in the very end, everything will be erased away. Sadness, agony and despair will definitely take my form, replacing my place in Yoshi-kun’s heart. If I can do this much, I’m finally in his heart. This is the only way to remain in his heart. Originally, the reason why all traces of me vanished was because I wanted to go to the future. The world had to keep erasing my existence because I lived. In that case, if I die, there’s no reason for me to be erased. Of course, the past that was erased won’t return, but the present that’s not taken away will remain. Being lovers for just one week. During that golden period of time, I probably had engraved myself firmly, strongly within him. More importantly, Yoshi-kun yearned for me. He reached his arms out, crawling out to me. He kept struggling for me. But even after all that, to not obtain what one wants will surely became a large wound that can never disappear. He’ll cry, endure pain, and remember me. Thus, I can continue to remain in his heart. I could hear Yoshi-kun’s tired panting from the other end of the phone. I could hear him sprinting. Sorry. I wanted to say this selfish word, but I swallowed it back. Those words were too sharp, such that I, who forced myself to swallow, nearby burst into tears. Beads of sweat slid towards my cheeks. My body’s feeling hot, and heavy. But I couldn’t stop. I had to keep running. I turned right down the long highway, down the slope. It’s a really deep slope. I quietly warned myself to be careful, but my anxious feelings wouldn’t allow myself to slow down. After taking the first step, the second step strode forth without control. Uh oh. My heart’s pounding wildly. Even so, I couldn’t stop. I was like a fly in the sky, moving forward. Whenever my feet landed, there would be a shock dozens of time greater. I kept running, and naturally, I reached my limit. The right leg gave up on supporting the body weight as it bent over. I could clearly hear that stupid sound. Fuu. I let out a long sigh. Time was the only thing that passed. Several times already, I wanted to hang up, but I couldn’t. What’s wrong with me? The time limit’s ticking closer. Come on, hang up. There’s no way he’ll make it here. It’s a waste of time to keep hesitating. If I don’t die now, I won’t remain in his heart. But my body couldn’t move. My name he called countless times surrounded my arm. I closed my eyes, saw his gentle smile, and my legs felt heavier. I kept thinking and thinking. I kept brooding and brooding. And after that, I should have chosen my wish. Even though I knew it’ll hurt him. Even though I knew it’ll make him sad. It was from the other end of the phone, from him. It was the sound of someone crashing, someone groaning. No, I couldn’t even hear that sound. For me, the one memory I didn’t want to remember awoke in me. Forgetting everything, I called out his name. At that moment, I grabbed the smartphone in my hand with all my might, curled up, and brought the cellphone to the my core. Because of that, I just fell onto the ground without using any ukemi technique. There was a sharp pain striking my left shoulder, causing me to groan. After rolling for a while, I stopped. I had difficulty breathing, and did my best to speak up, inhaling the cold winter air into my lungs with all my might. No matter how much oxygen I took in, I was having difficulty breathing. I had difficulty running, and my body’s in pain all over. This is terrible. I can’t even stand up. Physically, and mentally. I had a strange doubt remaining in my me. Yuki’s definitely suffering. She’s always been alone, working hard till this point. At the very least, let her be selfish to the very end. I kept thinking of words telling me to give up. And even if I did find her, what did I intend to do? Was I prepared to change Yuki’s determination? I had all sorts of excuses coming up in my mind. I’m already working hard. I had lots of unbearable experiences, and got myself dirty all over. This should be enough, right? There’s one thing. Yuki’s voice was coming from the smartphone in my hands. Yoshi-kun, are you alright? What happened? Hey! Yoshi-kun. Answer me! I barely managed to move my body, and ended up lying on the ground, slowly opening my eyes. The dazzling light shone into my vision. The moon was shining upon me. My mind’s completely awake. The voice in my mind faded, and I could only hear a girl’s voice. Ahh, what? You don’t have to be so worried about me. But I’m really happy about this. I called out the name. Just as she called out my name, so I called hers. With the same trembling voice, Yuki snorted. She didn’t seem to be enjoying this. There should be more things I wanted to say. There should be more things I had to say. You like weirdos, don’t you? Then I’ll be a weirdo. After some silence, yes, Yuki muttered. She knew. The past would refer to four years ago. Back then, there was a boy who couldn’t honestly say what he wanted. For most of the things, he chose to endure, to give up. That boy no longer exists anywhere in this world. Because I can’t stand for this. I can’t accept that Yuki’s crying. If I can ensure that the girl dearest to me won’t cry, I’ll do everything, even if I’ll have to give my all. Something I really wanted from the bottom of my heart. Something I was afraid of losing. Something I was willing to give my all for. Suddenly, various things linked in my mind. Lines were formed, like the constellations appearing in my eyes. I caught sight of Orion’s light. Some time back, I mapped the stars with the picture books, connecting the stars into constellations. Was I really alone back then? Definitely not. I exclaimed. Yes. I finally found the link. Finally, I can confidently say that I believe you. Yuki’s voice on the phone was filled with doubt, but I ignored her, and continued. On the other end of the phone, Yuki gasped. I went to various places alone, and did lots of things. I enjoyed these things in my memories, all because Yuki was next to me. It’s fine, Yuki. It’s fine. You didn’t take anything away from me. Not only that, you gave me lots of things. A girl did her best to change me to my current self. I closed my eyes tightly. I opened them. The vision’s shockingly brighter. I exerted strength into my right hand. I felt heat. It might be because I was using the phone for a long time that the phone was a little hot. However, it’s not burning. It’s as warm as Yuki’s palm. I had to keep grabbing it, so that I wouldn’t lose it, that I wouldn’t let it slip. We call that heat ‘love’. I put my hands on the floor, and stood up. Tsuu, haa. I was aching inside. I nearly cried. But I took the first step. I took the second step. I gritted my teeth, and sped up. I ran by my middle school. How many times did I chase after a certain person’s shadow here? –she’s not here. I ran by the convenience store, which I passed on my way home after club activities ended. How many times did I eat ice cream alone here? –she’s not here. I passed the bookshop I often visited. How many times did I purchase the new novel publications? –she’s not here. Before I knew it, the library’s right behind me. How many times did I struggle with the maths assignments alone? –she’s not here. I passed the game center, the karaoke, the bowling alley, the batting center, the cinema. She’s not in any of them. This town’s filled with my lonely memories. None of them had Yuki’s presence. But at this point, I can see a certain person over there. After she was erased, something was always used to cover up a person’s existence, yet I did hear laughter. It sounded really happy, belonging to the girl I like. I turned right at the T junction, and ran straight ahead. How many times did I run down this road alone? But back then, surely there was Yuki before me. Haa, haa. I kept driving my legs. I looked forward. It’s the path towards Yuki, from the vanished time. I looked towards the public hall far away. I saw the little billboard. I saw someone inside a public phone booth that was glowing dimly in the darkness. Even though I could only see a silhouette, that person’s making a call. I found her. I heaved a sigh of relief. I reached my hand out. Just a little. Just a little more. The clock hands wouldn’t stop. There was still some distance between us. I couldn’t see Yuki’s face clearly. I couldn’t hear Yuki’s voice. My voice couldn’t reach her. I was here, but Yuki never noticed me. Anxiety, sadness, rage. And most of all, fear. I was gasping, short of breath. I couldn’t make a sound. The word end appeared in my mind. No, no, no. I don’t want this end, no! Yuki, who’s been quiet the entire time, suddenly said. The voice came from the phone. Why are you saying it like it’s the end? This isn’t the end! It’s not over. You’re still here, Yuki. You’re still here. Yuki’s hand was really cold. But soon it got warm. Because of that, I was happy. If I could have said, it was my first love, that would be great, but it’s probably not. I guess I fell in love with the same certain person 214 times. The same person. You. There’s no way I could tell. Yuki called out to me. Surely, Yuki kept living for the sake of these words. –This is the Happiest Love Story on this World. Her voice was no longer shaking. Finally, my dearest Yuki said the words of farewell, as proudly as she normally was. And at the same time, the chest ripping pain became heat as it slid down my cheeks. Did my words reach her? Just a little longer. Yuki can change her mind again if there’s some opportunity, some time. But that some wasn’t enough. My knees ached. I endured, making sure that I didn’t let out a groan. My knees were shaking, and I couldn’t exert strength. It’s like my strength was flowing out from a wound, along with blood. I was losing balance. I expended everything just gritting my teeth, forcing myself not to fall. Why!? Why now!? Get moving! I don’t care that I won’t move ever again! Get me over to Yuki! Please! The girl I like is over there! I called out the name dearest to me in this world, towards that little light. I prayed that my voice could reach her. This was all I could do. And at that moment, the world silently changed. In that moment, when eternity seemed compressed, I dreamt that I saw a girl. The Yuki who said she likes me. The Yuki who sought a reason to hold hands. Who fought in a snowball fight. Who went to the theme park. Who kissed in the classroom no one else was in. Our memories together, past events, Yuki’s voice, actions, expressions, each of them fell one by one, and upon contact, didn’t pile up. Instead, they slipped from my hands. Ahh, wait. Wait a second. Soon, the final words melted, and fell. Yuki’s smile appeared in my mind. This was the last fragment belonging to Yuki within me. My foot speed slowed. Not long after, I stopped in my tracks. There was just one syllable left in my sentence. But I no longer knew what it was. I never knew what the world took from me. I took a deep breath to recover. Suddenly, I felt a sudden pain in my knees. It was the grazed wound after I fell. I took a hard tumble, and ended up injured all over. I was scared of pain, and shed tears, but I kept running to a certain place. Even so, I ended up stopping. I was crying, but I ended up acting tough, and the voice ultimately never reached anyone as it slowly disappeared. A half moon was high up in the sky, and the moonlight shone into these eyes of mine, while I knew nothing. The phone line was quietly cut off. Like the two hundred and so times before, the world cruelly cut off my contact with him. The voice was teeny weeny, yet it was like the stars dazzling in the night sky, sparkling in the middle of my heart. Wait for me. Keep living. These words were still calling for me. They shouldn’t have existed at all. So why were they still shaking my heart? He’s the weirdest person on this world. Before I knew it, I was smiling. I was able to smile. For my hands were full with what I could hold. The place I finally reached, the place Yoshi-kun led me to, the ending that was more wonderful than I expected. In the future, he’ll surely be smiling. He’ll be smiling along with the long time he spent with me. That’s why I’m happy enough. I wiped my tears hard, and stood up. I put my hands in my pocket, and my fingers touched something hard. What is it? I took it out, and found chocolate. It’s a really common type sold everywhere. It doesn’t cost 100 yen, and it was given by the boy whose name I knew not of back then. That was our beginning. Well, at the very least, I should give this to him. We promised. Didn’t the lying boy finally fulfill this promise for me? He called out my name. Half of it. It’s just one syllable, but I did hear it. It’s not a voice through the phone line, but his honest voice. Let’s go fulfill that promise. Dad, mom, Umi. Mind waiting a little longer…just a little? I left the phone booth, and in a corner of my eyes, I caught sight of a silhouette whose name I knew not of, but I didn’t check, and left in the opposite direction of that person. In the distant horizon, the light of the half moon shone into my eyes. It’s been a long while since I was so madly in love with this world. Back when I loved this world, so much that I wished to live on.